The sculpture, titled “The American Issue”, symbolically portrays the divide in America over the 18th Amendment which prohibited the sale of alcohol. 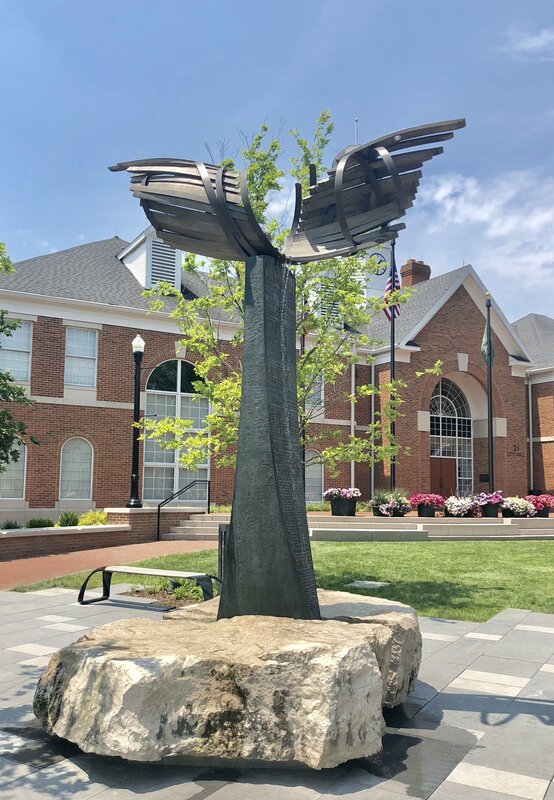 It embodies the conflict between government regulation and individual freedom and celebrates the historical significance of Westerville as the Home of the 18th Amendment to the United States Constitution. The limestone boulder represents the people of the United States, the bedrock of the Nation. The stone is being split and divided by a large wedge with quotes printed on opposite sides. On one side the quotes promote the passage of the 18th Amendment. On the opposite side they seek the repeal of the 18th Amendment by passage of the 21st Amendment. The quotes demonstrate the elegance and fervor of arguments on both sides of the issue. The design of the quotes on the wedge evokes the news journals of the day, and the use of raised lettering is symbolic of the printing presses used to print The American Issue, which was the official journal of the Anti-Saloon League. The headquarters of the Anti-Saloon League was located in Westerville, which became known as the “Dry Capital of the World”. From Westerville,The American Issuewas distributed nationally, effectively carrying the message that ultimately led to the passage of the 18th Amendment. Balanced atop the wedge is a barrel used to distribute alcohol. The barrel is unraveling, symbolizing the barrel’s inability to “contain” the prohibition conflict even after the passage of the 18thAmendment. The unfurling of the barrel has a slightly helical shape referring to a strand of DNA and the influence of heredity in the disease of alcoholism. 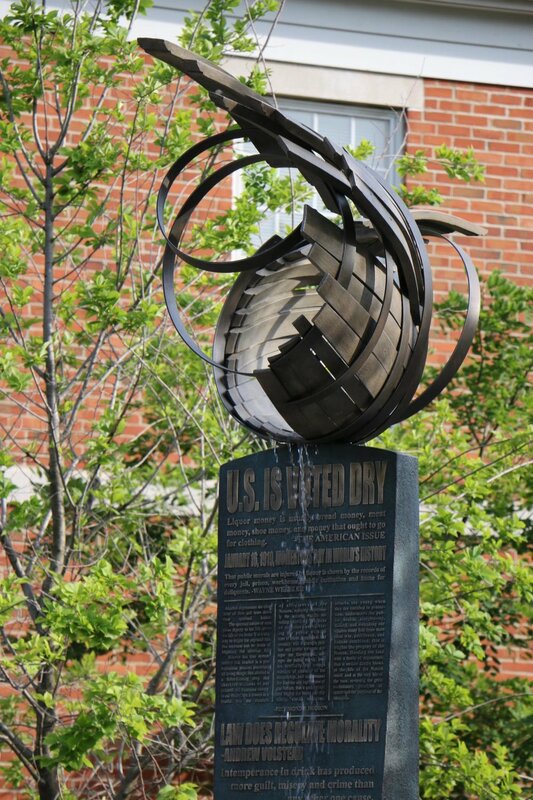 Water, representing alcohol, perpetually flows from the barrel down both sides of the wedge, over both sides of the issue, symbolizing the complex nature of this social issue. Lastly, the sculpture represents the dualism within each of us as we choose the paths of meaning in our lives, to live fully and freely, with a moral code that minimizes suffering and provides the basis for the betterment of ourselves and our society. Photo credit - Matthew Palmer except as otherwise noted.